A partial colectomy is the surgical removal of a section of the colon. This surgery is used to treat a number of diseases and conditions, including inflammatory bowel disease, colorectal cancer, bowel obstruction and bowel perforation, according to MayoClinic.com. Partial colectomy is an invasive procedure and comes with a number of complications. Early complications are complications that occur within 30 days of surgery. According to a 2008 study published in the "American Journal of Gastroenterology," the most common early complications of partial colectomy are abscess, infection and fistulas. 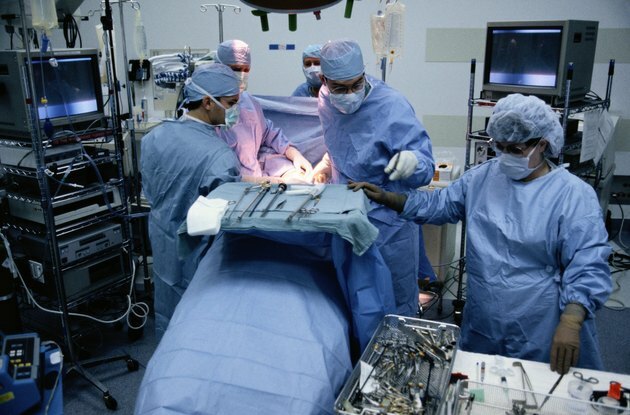 Roughly one in every four patients undergoing partial colectomy will suffer from early complications, according to a 2009 review published in "Genetics in Medicine." Late complications are complications that occur after 30 days, but within six months of colectomy. According to a study published in the "American Journal of Gastroenterology", the most common late complications are small bowel obstruction, urosepsis, pneumonia and bacteremia. Late complications occur in roughly half of patients undergoing partial colectomy. According to a review published in the journal "Genetics in Medicine," partial colectomy has an overall 30-day mortality rate of 0.9 percent. This means that one in every 111 patients will die due to complications related to partial colectomy. According to the Mayo Clinic, other complications of partial colectomy include bleeding, injury to nearby organs, and blood clots in the lung and the legs.